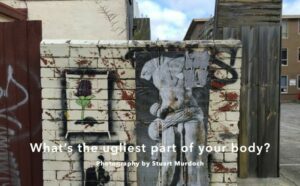 “Whats the ugliest part go your body?” is Stuart’s latest foray into self publishing. It is a 54 page self published book that examines the idea of of chance and coincidence. The pictures are made on the device on hand most often with him, a smart phone. What makes the work cohesive is an editorial style that looks for patterns or recurrences of imagery after the images are made and then reviewed as a kind of archive mining. The book is part of a larger ongoing project that spans several years of carrying smart phones around. It can be purchased though blurb or from him directly.